Bison tastes great! The value of Bison is not what you pay, but what you get in return. Nutritionally you are getting more protein and nutrients with fewer calories and less fat. Bison is a dense meat that tends to satisfy you more, while eating less. Bison are handled as little as possible. They are not subjected to questionable drugs, chemicals or hormones. They spend their lives on grass, much as they always have. Bison Meat (American Buffalo) is similar to beef and is cooked in much the same way. The taste is often indistinguishable from beef, although Bison tends to have a fuller, richer, sweeter flavor. It is not “gamey” or wild tasting. 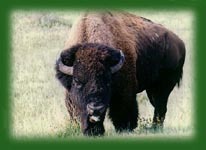 Bison is low in fat and cholesterol, and is high in protein, vitamins and minerals. Fresh cut Bison meat tends to be darker and richer in color than many of the other red meats. The lack of fat insures that Bison meat will cook faster. Fat acts as an insulator - heat must first penetrate this insulation before the cooking process begins. Marbling (fat within the muscle) aids in slowing down the cooking process. Since Bison meat lacks marbling, the meat has a tendency to cook more rapidly. Caution must be taken to ensure that you do not overcook Bison. When oven broiling Bison, move your broiler rack away from the heat about a notch lower from where you normally broil your beef steaks. Check your steaks a few minutes sooner than you normally would. Bison steaks are best when cooked rare to medium rare. If you normally cook your roast beef at 325°F, turn your temperature down to 275°F for Bison. Plan on the roast being done in about the same amount of time as with a comparable size beef roast. To insure the temperature you prefer, we recommend using a meat thermometer indicating the internal temperature. Again, rare to medium rare is recommended. Slice all roasts across the grain of the meat. Ground Bison or Bison burger is also leaner (most ranging about 88-92% lean). It will also cook faster so precautions must be taken to not dry out the meat. There is very little (if any) shrinkage with Bison burger. Hint: the thicker the patty, the juicier the burger. Again, rare to medium rare is best. Although ground bison is leaner, there is no need to add fat to keep it from sticking to the pan or falling apart, and you don’t need to drain any grease from the pan!